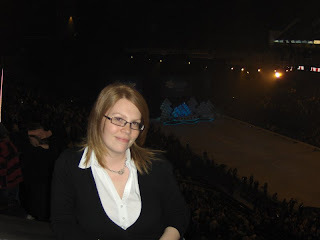 On Tuesday Tadders text me to say she had a spare ticket for her company's box at the O2 for Dancing on Ice. I've watched it a couple of times on the TV but never really got into it but it was free and I am never one to turn down a free night. And I have to admit, I was pleasantly surprised. 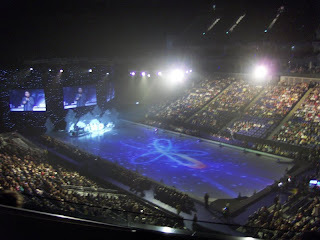 The night kicked off with some dramatic skating which ended with Torvil and Dean performing Bolero. Sad little secret of mine is that mum and dad had Torvil and Dean's 1984 performance of Bolero at the Sarajevo Olympics on tape and I often watched it. I think there was something else on after it but can't remember what. 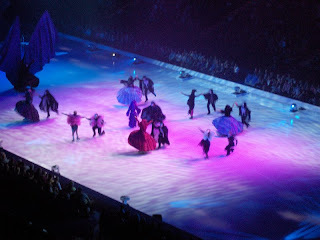 I was very impressed with all the celebrity skaters. Given that none of them are professional skaters they were pulling off some complex moves. Kieran Bracken was the stand out for me with his back flip off a podium onto the ice. Despite the cheese, I had a good time, even when Tadders went mad cheering for Chris Fountain who won on the night.